A woman wept after a hearing in which she was charged with having a loaded handgun in public while drunk. 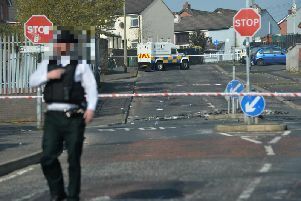 Appearing in Dungannon Magistrates Court, 59-year-old Gillian McCutcheon confirmed she was aware of the two charges against her. Cookstown woman McCutcheon is accused of possessing a loaded firearm in public, at Sperrin Court, also in Cookstown, while under the influence of drink or drugs and possessing a firearm, namely a handgun and 10 rounds of 9mm ammunition, under suspicious circumstances on 8 January this year. A detective constable told the court he believed he could connect McCutcheon to the charges while a prosecuting lawyer said the full file has already been received and been passed to a directing officer in the PPS. It was confirmed to District Judge John Meehan that the weapon has been removed. Releasing a weeping McCutcheon on her own bail of £200, the judge ordered her to come back to court on February 19.